6.47 points at 15 votes (rank 523). You take part in the Olympic Winter Games in Sarajevo in 1984 as an athlete. There are altogether three disciplines. At Slalom you need to absolve the parcours error free as fast as possible. In Ski Jump the furthest jump with a standing landing wins. In the supreme discipline - Downhill - you have to reach the finish line without a crash within under 40 seconds. For each race there are points, that are added at the end. 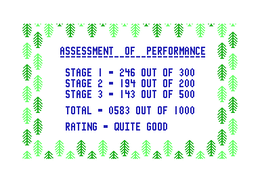 The computer evaluates the total score correspondingly. The player with the most points wins the game. 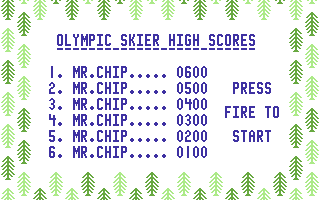 The game offers vertical scrolling. The graphics and sprites are kept simple. There is a title music and two intermediate tunes between the disciplines. With the key RESTORE you can jump to the main menu at any time. 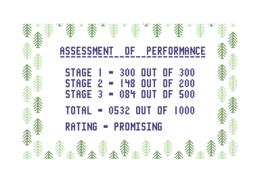 If you do not reach the finish line, you recieve (depending on the distance absolved) up to 99 points. If you reach the finish line, you get with a time of 23.0 (or slower) exactly 100 points. For each 1/10 second that you are faster, there are additional 2 points. One of two possible gate misses cost each 3 penalty seconds (= 60 penalty points). The maximum score is 300 points which you get with 13 seconds and below. Go down with maximum speed! If you pass a gate successfully an acoustic signal will ring. No unnnecessary movements. --> The shortest way is also the fastest. You should go over the finish line at the far left. There are each 4 points per 65 meter. A maximum of 200 points (115m) are possible. When you crash your score is divided in half! A high speed is already half the battle. Jump as late as possible. Only press the joystick (from the top) downwards when landing. If you crash you get up to 199 points depending on the distance covered. If you need more than 40 seconds this equals a crash. If you reach the finish line, you get exactly 200 points when needing 40 seconds. For each 1/10 second that you are faster you get 2 more points. The maximum points are 500 points which you get with 25 seconds or below. During a jump you cannot steer. Study the map to find the simplest and fastest way. How do you reach the maximum points (200) at Ski Jump? Hammer like a madman on the fire button in the start-up phase! At the edge of the jump-off platform push the joystick upwards and keep pushed. At the very last moment pull the joystick downwards to land smoothly. Werner: "A simple and fast game which does not take two minutes to play and goes without loading. Therefore it can be played by several players one after the other. All the same, 7,5 points from me." 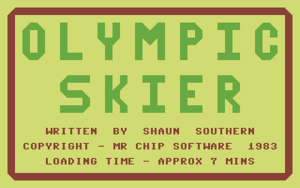 TheRyk: "Amazing but true, this 1983 game is one of the first multi event sports games ever - in a single filer. Maybe Shaun Southern made Downhill extra tricky to compensate for the fact that there are only 3 events of which Slalom and Downhill are quite similar. But better small, easy and great than long, complicated, boring or always the same as you often find in late 80s winter multi event games. Good game, 6 points!" 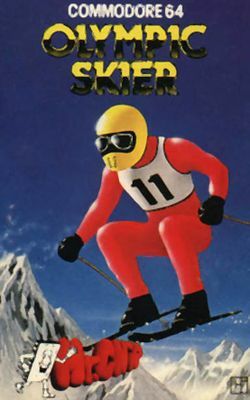 Kiki77: "When I had my new C64 a good colleague of mine came over with a cassette which contained Olympic Skier. It was really lots of fun in twos, but also only with one player. 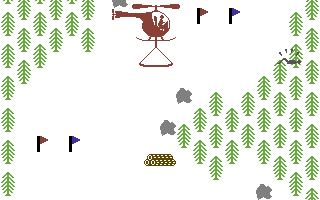 The graphics were kept simple, but the fun in the game was there many times over. For 1983 the graphics were still good. Therefore 8 big nostalgia points." At Ski Jump there are differences in the score! Also in the graphics (title screen, fuller trees in the Americana Software version, clouds) and sound there are differences. This page was last modified on 11 January 2015, at 13:00.